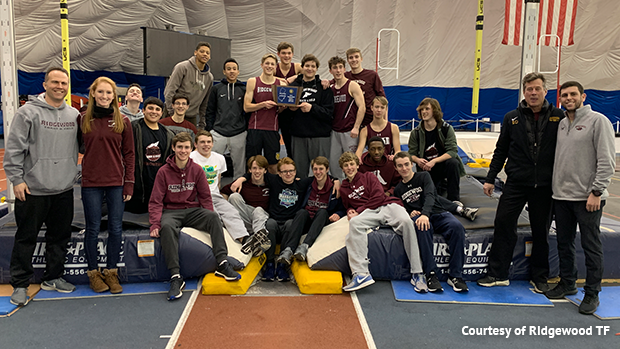 The Ridgewood boys and girls continued their dominance at Friday's North Jersey, Sec. 1 Championships by sweeping the team titles for the second straight year at the Bennett Center in Toms River. The girls ran away with its second straight championship by racking up a sectional record total of 107.5 points, while the boys used a dramatic late rally to edge East Orange Campus by two points for its fifth straight team title. In the 12 year history of the state sectionals, the Ridgewood boys have now won seven titles and the girls have captured six championships. In the boys competition, Ridgewood trailed East Orange by eight points with two events to go, the 3,200 and 4x400. Ridgewood went 1-5 in the 3,200 with double-winner Will Baginski earning the victory in 9:30.97. EO didn't score in the 3200, so Ridgewood took a 52-48 into the relay. Ridgewood came up with a clutch third-place in the relay (3:32.54) and EO was second in 3:30.05, just behind Passaic Tech (3:29.37). That gave Ridgewood the team title, 58-56 over EO. Baginski was his usual sensational self for Ridgewood. In addition to his victory in the 3,200, the senior also won the 1,600 in 4:23.61, and jumped into the 4x400 right after winning the 3,200! Ridgewood also picked up a big win in the shot put from Tom Vandalovsky (48-10), a third from Ryan Seaver in the 800 (2:03.38), a second from Jason Theisen in the pole vault (10-6), and a fourth from Alex Ruhl in the hurdles (7.97). The Ridgewood girls, whose 107.5 points broke the sectional record of 105 set by Randolph in 2010, scored in every event except the shot put, and were led by Camryn Wennersten and Katherine Muccio, who were double winners, and Virginia Morley and sisters Lizzie and Ellie Veenhof. Ridgewood dominated the distance races, scoring 54 points in the 800, 1,600, and 3,200 combined, which is more than the total points scored by runner-up Clifton (50). Ridgewood went 1-2-4 in the 1,600, 1-3-5 in the 3,200, and 1-4 in the 800. Wennersten, a freshman star, led the charge for Ridgewood in the distance races by dropping a US#6 and NJ#3 10:44.19 to win the 3,200, and she also won the the 1,600 in 5:11.32. Wennersten's 10:44.19, No. 8 in Bergen County history, is just off the state lead of 10:43.18 that senior Abby Loveys of Randolph ran at the Morris County Championships. Junior Julia Trethaway of West Morris is NJ#2 at 10:44.12. Loveys, Trethaway and Wennersten are now US#4, #5, and #6, respectively. Muccio, a senior, won the 55 dash in 7.40 and the 400 in 59.71. Morley, a senior, finished first in the 800 in 2:24.15, and Lizzie (5-2) and Ellie (5-0) Veenof went 1-2 in the high jump for Ridgewood. Ridgewood also placed second in the 4x400 in 4:06.42.